Poultry drench to provide a natural source of energy and nutrients for healthier, more productive birds. For use with chickens, turkeys, ducks and guineas. Give Nutri-Drench before worming or medicating. Additional dietary energy assists the body's ability for efficient absorption. 4 oz and 1 quart. Ingredients: propylene glycol, molasses products, calcium carbonate, choline chloride, DL-methionine, l-lysine, Vitamin E supplement, Vitamin A supplement, Vitamin D-3 supplement, thiamine, niacin, zinc sulfate, ethylenediamine dihydroiodide, magnesium sulfate, manganese sulfate, iron sulfate, copper sulfate, sodium selenite, cobalt sulfate, sugar. For rapid results, administer directly into mouth (undiluted). 1 mL (cc) per 3 lbs body weight. May also be administered into drinking water. Shake well. Store at room temperature. Provides 3/4 cup of water and/or feed for caged birds or rabbits. Handy for state or county fair show season. 20 oz waterer features a narrow trough to stop chicks and other small poultry breeds from submerging their heads and drowning. Fit to standard mouth bottles. Easy to use. Low cost method for watering young poultry. Easy to fill from the top and has a heavy duty carrying handle. Use for poultry, game birds, ducks, geese and turkeys. 3 gallon poultry waterer sits 5" above the ground, which keeps the tray cleaner. Easy to carry. For watering all types of poultry. Top fill design is easy to use. Optional legs raise waterer above the ground (5") to prevent soiling. Fits atop Blenheim feeders to prevent rain and dew from soaking the feed. This 8 gallon elevated waterer provides clean water for up to 100 birds or waterfowl. 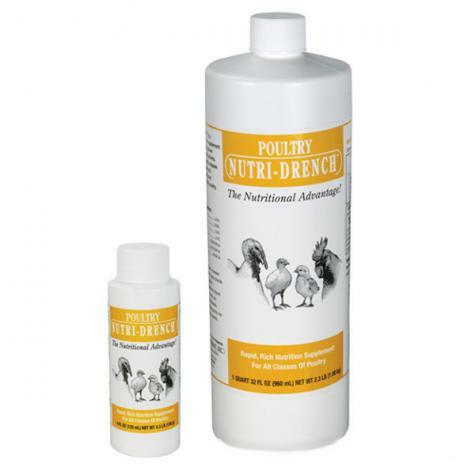 After getting new chicks or new chickens I always like to use Nutri-Drench in their water to give them the vitamins and minerals that they need just to make sure that they are healthy and well taken care of. Even through out the year I put it in their water to maintain their good health. This is to have on hand for ailing chickens. I got the small size as it is just to keep on hand. I have used PND for years and wouldn't be without it as long as I have poultry. A great product. I have used this product many years and find it more than satisfactory.